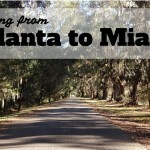 I hadn’t heard of St Augustine until I started researching stops for our Deep South road trip. It is a shame it isn’t more widely known, as it is fabulous and a great stop on a US road trip with kids. St Augustine is located on the Atlantic coast of Florida and is known as the US’s oldest city. 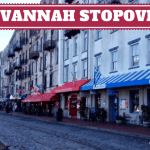 It is the oldest, continuously occupied, European founded city in continental USA. It was founded by the Spanish in 1565 and was the capital of the Florida territory until 1824. It changed hands between the Spanish and the British several times before it officially became part of the United States in 1822. It has an interesting history and we enjoyed learning about it as we explored St Augustine. St Augustine is also known for its gorgeous historic district, and it sounded like a perfect place for us to visit. 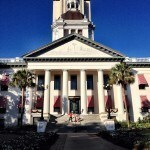 In fact, it became the place I most wanted to visit in Florida – a state full of interesting places. Thankfully, I wasn’t disappointed. 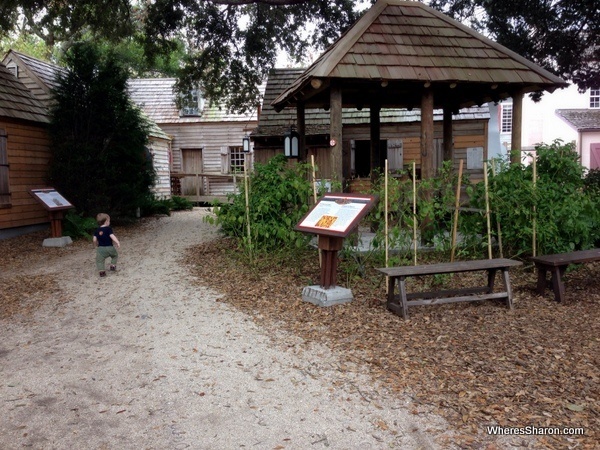 We spent a full day exploring St Augustine with kids. For me, that is enough for the historic district. It is not very big. However, it is packed full of charming shops and some of the most charming eating and drinking establishments I have seen, so you could easily spend more time hanging out here. We spent the day walking around the historic district and visiting a couple of the attractions. Here are our thoughts! 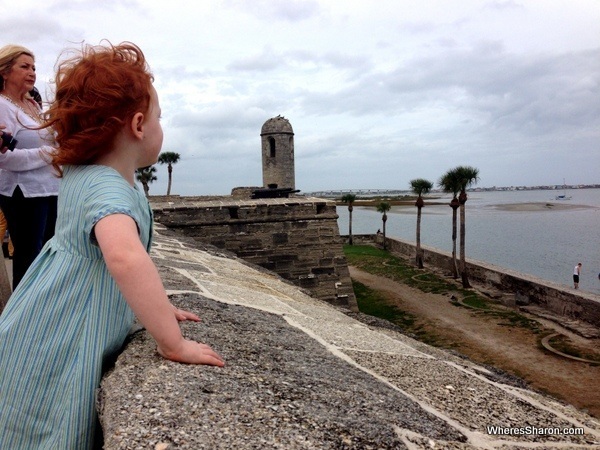 4 Other places to visit in St Augustine with kids? The historic district is a lovely area full of quaint shops and places to eat and drink. We found the food and drink to be great value considering the surroundings. It is an absolutely fabulous place to walk around, although it did get very lively as the day pushed on. We had the streets to ourselves first thing in the morning. There were many buskers which added to the great energy of St Augustine’s historic district. We were surprised when we found one playing the didgeridoo! I also learned that popsicles were not what I thought they were when we visited a very cool popsicle shop. I thought they were what I call “icy poles” – water based frozen treats. I realised “popsicles” also encompasses milk based ones. I am definitely improving my American English on this trip! 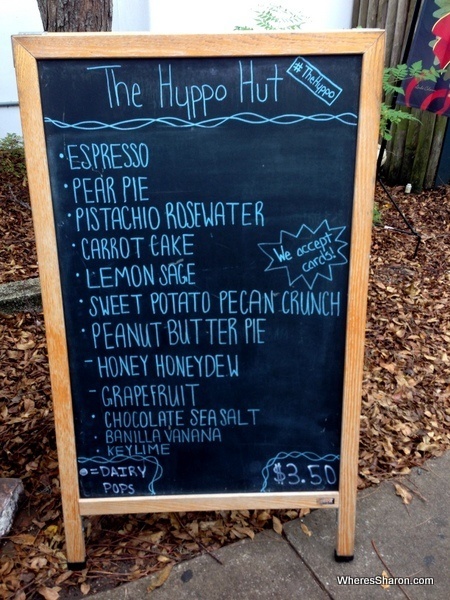 Anyway, if you want some of the best popsciles on Earth – head to Hyppo! I can still taste the peanut butter pie months later. 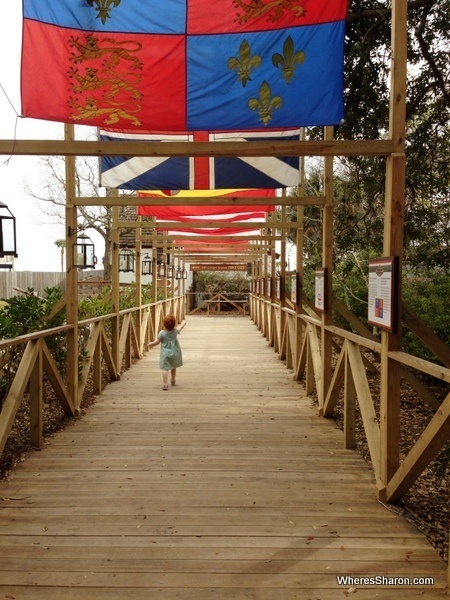 The Colonial Quarter is a great place to go to learn all about the history of St Augustine in an interactive way. There are four different sections – 16th century Spanish first city, 17th century Spanish fortified town, 18th century Spanish garrison town and 18th century British colony. Each section has different experiences and things to see from the time, so the whole site is like a journey through the history of St Augustine. This attraction can be explored alone. However to really understand and enjoy the attraction, you’d be crazy to not do the included tour. These run regularly and take just under an hour. The guides are dressed in period costume and our guide was very entertaining. He led us though the different sections and we did things like watch a blacksmith demonstration and learned how to fire a musket. The tour finished with the only original house in the park which was fun to explore and had views over the main pedestrian thoroughfare of the historic district. We enjoyed this attraction, especially the tour. The kids found it interesting enough that we were able to make the most of the tour. However, I was disappointed that the guide acted as the only old style tradesmen when the advertising material made it sound like we should have seen a carpenter, candle maker, etc, so I didn’t feel like we got our full money’s worth. Their site also says that there are people in period costume around their site that act in character that we can ask about their lives. We didn’t see anyone in costume apart from our guide. The kids loved many parts though. There was an archeological dig that was a big hit. The blacksmith demonstration and the muskets elicited many wows and amazings. We were unable to use our pram in this attraction as the paths were not suitable for a cheap stroller. Overall, it was definitely a hit. The entry ticket includes a discount at a few surrounding eateries, so we had lunch at the neighbouring British style pub which was great. Check out ticket prices and more on the Colonial Quarter website. 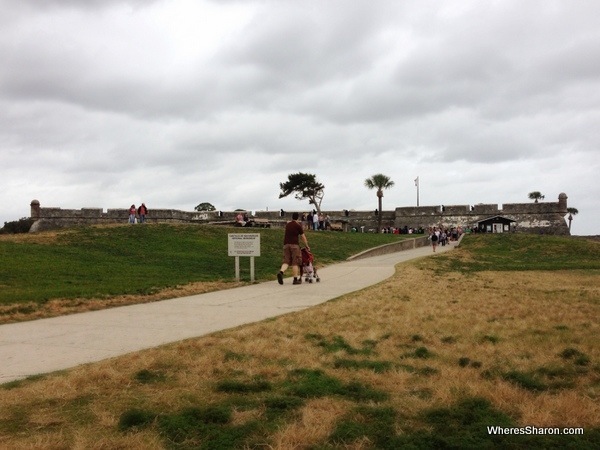 Another place to visit when exploring St Augustine with kids is the Castillo de San Marcos National Monument. 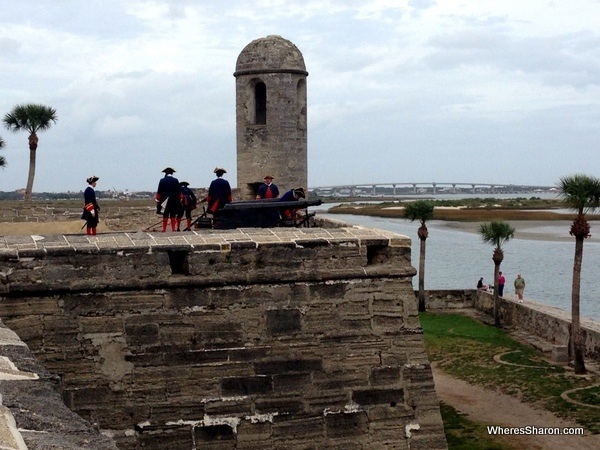 It is a Spanish fort, the first masonry fort in the US built in the late 1600s. It is located next to the historic district. The fort is small but very busy. We explored all the fort including the museum which is set up in the ground floor rooms. On weekends, there is a canon fired every half hour if there is enough people. A small group of park volunteers dress up as Spanish soldiers and do a reenactment in Spanish. It was cool to watch but very loud – cover kids ears! There are lots of cannons on the fort. Admission $7 per adult (kids free). Find more information on their website. Other places to visit in St Augustine with kids? 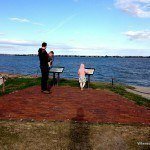 There are quite a few attractions outside the historic district area that you can visit with kids. We had wanted to go to the Alligator Farm Zoological Park the following day, but the weather was not good. We were also tempted by the Fountain of Youth as it sounds like the type of whacky road trip attraction that we have been looking for during our Deep South tour. 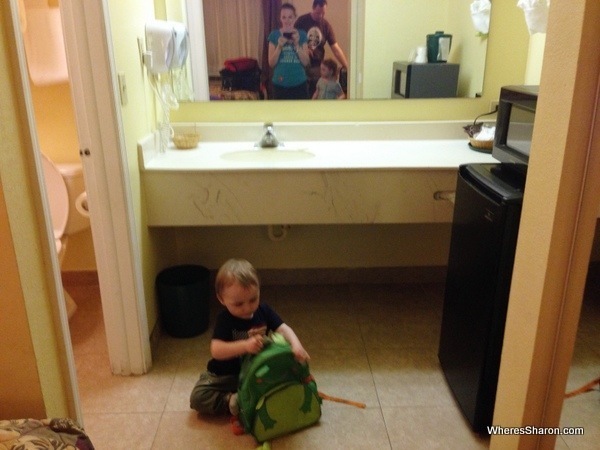 We stayed at Days Inn St Augustine which is located within walking distance of the historic district. It was a usual budget standard with two double beds, fridge and microwave but with no breakfast included. It cost more than our usual budget as it was so central. I think it was great value given the location. It was clean and quiet. Thanks to spending a bit more on accommodation and paying entry fees at two attractions, we went slightly over our budget of $136. We could have avoided this by cutting out either the Colonial Quarter or Castillo De San Marcos and by having a cheaper lunch. The kids had a great time in St Augustine and this is a great place for a family trip. We visited all outdoor attractions which helped. The kids ran around happily at Castillo De San Marcos, although S kept giving me mini heart attacks when she kept leaning over the edge. They loved the Colonial quarters thanks to there being lots to interact with. The main stretch of the historic district is a pedestrian street so that makes this a very easy place to wander around with kids. 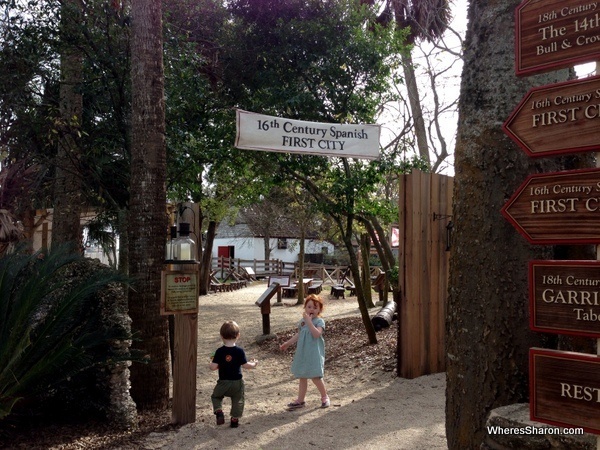 All in all, St Augustine is a very kid friendly destination. We loved St Augustine. It could have easily been a disappointment coming straight after interesting Charleston and beautiful Savannah, but it definitely held its own. 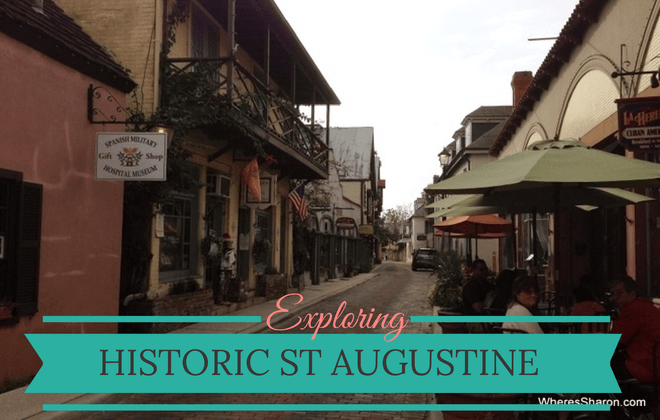 St Augustine’s historic district is a pretty, atmospheric place to spend a day and we enjoyed it a lot. The attractions we visited were worthwhile. We were there on a Saturday in December, and it was very busy by the afternoon, so I recommend getting there early. I wouldn’t have enjoyed it had it been any busier. In saying that, we didn’t have to walk far to leave all the people behind. We were sorry to say goodbye, but excited to head back into southern Florida and West Palm Beach. Do you have any tips for St Augustine? Museo Infantil Trampolin - Children museum Dominican style! 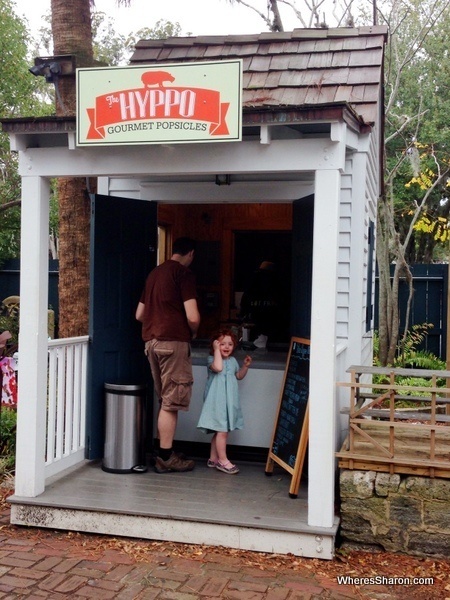 Looks so quaint Sharon, and I love the Hyppo shop image 😉 Thanks! I haven’t been so I enjoyed your photos! Loved the bridge with the flag. I was expecting the historic part to be a little, well, twee, but loved the little indie popsicle shop! Chocolate sea salt is calling my name! Oh yeah, I could go back to St Augustine just to have another ten popsicles!! Thanks for such great tips! I think that if we venture to this part of the world, I too wanna run along that bridge of flags. 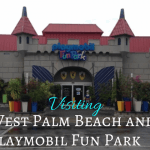 We love St. Augustine, luckily, we go there every summer (native Floridians) — another great place for kiddos is Davenport Park where they have a great kids carousel that only costs $1 to ride. My kids love it and we go each time we visit. It’s just down the road about a mile from the Fort. Great article! Thanks. I was tempted by the Fountain of Youth as well, but couldn’t persuade my teens to visit with me. My family also enjoyed the beach (gotta love free), Fort Matanzas, a tour of Flagler College and the Alligator Farm. We were extremely disappointed to realize that we pulled into a speed trap from the Alligator Farm on our trip. We got a ticket (though we think we were picked on since we were out of state and required to have a front license plate). Most expensive ticket we have ever gotten. Ever. My husband was irate. Needless, to say, the fun and spending money in St. Augustine sadly ended there. Oh no what horrible timing. It is so hard to not get angry and have it ruin your day when things like that happen. What a shame. We wish it had been beach weather when we were there. It was nice weather, but not warm enough for that (at least not for us Australians 🙂 ). 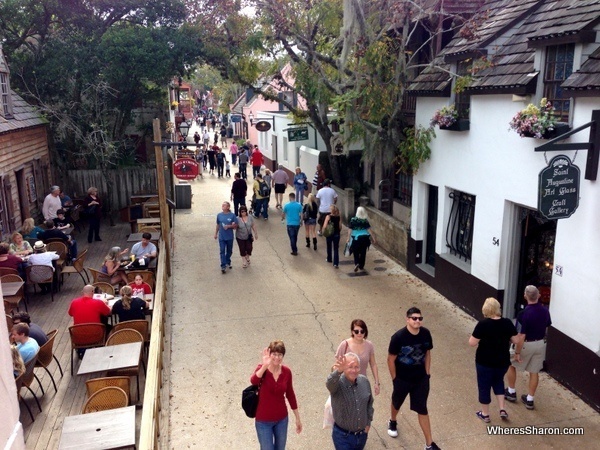 We have had St. Augustine on our radar for quite some time now and still never ventured there! Hopefully we will change this in the near future because after reading your post and other research, it really looks like an interesting place worth exploring. The historic district in particular looks like a spot I could spend some time wandering around. It is a lovely place to just wander around, as well as to have a few drinks or a lovely meal. I would have loved to just sit in a restaurant or bar on the main strip for the afternoon people watching and soaking it all in. Did you find the coffee shop called Kookaburra Coffee there? It’s Australian owned and has Australian coffees on the menu. I felt really smart getting to explain what a flat white was to my husband 🙂 I only knew because when I was living in Sydney, I was asked to make someone a flat white at my job and I had NO idea and had to look up directions on Google! No I did not. I actually didn’t realise a “flat white” was an Australian thing! !